Twitch and Youtube settings guide - Encoding settings required for a good gaming stream. I have recently come upon information regarding quality calculations for streaming, provided by another forum user (sorry don't remember). I decided to publish that information in a more useful manner so that people can stream wiser. Bitrate = res_width * res_height * fps_count * quality_factor (measured in bits pers second). Wow, interesting read. Thank you for posting this! My average kbps is at 1800 kbps, is it normal? If you're not using CBR, then yes. You should really use CBR, though. In your guide you mention that it's impossible to do more than 3500 bps for Twitch. To my understanding, the 3500 limit is for non partnered streams, but for those who are partnered, they can go over that. We can only tell whats officially listed on the twitch page, and that is 3500. For further questions, you will have to contact Twitch.tv. Actually you can go with 9000 kbps if you want, but the ingestion server will drop anything over 3500 -> you will have laggy, impossible content. I run with 3650 as my personal little cheat, but at circa 4000 they drop of portion of it. Never mind, solved my own problem. So, we know that you want your video file size not be be over more than 300MB. What about resolution? How long will the video be when you are done recording? What will you be recording ... high or low motion content? As an example; going with a bitrate that would be able to be streamed to twitch (with a quality that won't be considered good for a local recording and material meant for editing) you will be consuming ~3500kb/s. Math tells us that if your max video file size is 300MB, this will give you about a 1½ minute of recording. I am really bad at this, so someone correct me, but isnt it more like this? Bad comment. I was mistaken, you were right. Oh and Bamse talked about streamable bitrate so he probably meant 3500kbps?! If the question is "If you have a 300 megabyte video file that was encoded at 3500 kilobits per second, how long is it?" then the answer is ~685.7 seconds, or ~11.4 minutes. Those are literally the exact same thing. kbps is kb/s. The p (per) is swapped out for a / (per). Bit rate is measured in kilobits per second, not kilobytes per second. I interpreted kb/s as KB/s. It is my mistake. The math in my guide should still be good though, I have to check. That VOD is of PlanetSide 2, which is normally a disaster to record at a good quality due to all the explosions, fog, rapid camera movements etc. Using what I learned in this thread though, you would have to be splitting hairs to find any major artifacts worth mentioning. One thing to note about BPP is 0.1 @ 720p is not the same as it is @ 540p. 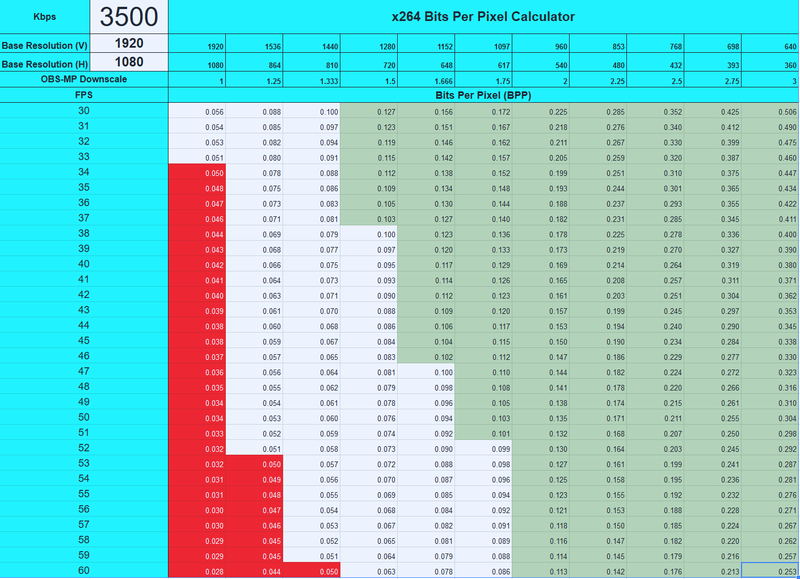 As you increase in resolution you require more BPP to achieve the same artifact free quality. So again, it is just a guideline, a starting point. Recording sample videos and seeing what it looks like is still going to be the best judge. I use a base resolution of 1440p. I have been having great results with 3500Kbps 640p45 Bilinear , Medium CPU Preset, Film Tuning. I'm relatively new to all of this, and as such my video quality is pretty bad. I saw this article and thought: "YAS!". Then it struck me. It is kinda old. And i'm not sure if the bitrate settings in OBS are measured in kbps or bps. Also my potato rig is pretty bad, i know, i know. But the quality i get is just unfair. Is the bitrate setting in OBS measured in kbps or bps? Is it relevant with CBR and 1080p@60 for YouTube (videos not streaming)? What is the right bitrate (for potato rig/YouTube)? Is 1080p@60 a bad choice for me?